Experience cottage country without leaving Calgary. This four-season lake community in southeast Calgary features a 43-acre freshwater lake and a 13-acre private beach and park, all at a very affordable price point. You'll find charming homes in this new suburban neighbourhood, and the lake offers seasonal boating, fishing, and skating activities. An extension of the C-Train is planned to run along the eastern boundary of Auburn Bay, and it's close to shopping, golfing, the Seton Rec Centre, and the new South Calgary Hospital. An oasis in Calgary, Lake Chaparral is a unique neighbourhood with a picturesque setting. The community has a magnificent 32 acre lake and a 21 acre recreational park with two waterfalls. Situated in southeast Calgary, community residents have easy access to the downtown core. Marquis of Lorne Trail runs along its northern border, acting as a divider between the hustle and bustle of Calgary and the isolated paradise that is Lake Chaparral. A beautiful lakeside community situated in Calgary’s southeast, Lake Bonavista offers homes close to shopping amenities, recreation, and entertainment activities, all without sacrificing its relaxed atmosphere. Residents can participate in a variety or community programs and activities for the recreationally-inclined. Lake Bonavista’s location close to Deerfoot Trail provides quick and easy access to downtown Calgary, as well as the international airport. The bustling community of Mahogany has a unique layout and a quaint atmosphere. This private and exclusive community was constructed with 84 acres of lake and beachfront, making it Calgary’s largest freshwater lake. Mahogany provides excellent outdoor opportunities for active residents. Award-winning builders provide numerous housing options for potential buyers. From starter homes, townhouses, and condos to mid-range detached homes and executive homes with lake front living. Named after one of its first settlers, the community of MacKenzie Lake is situated on good farmland, with quick access to the city of Calgary. West of the lakeside community is the Bow River and Fish Creek Provincial Park. MacKenzie Lake offers residents ideal views of the City of Calgary and the Rocky Mountains. Public and private schools can be found near the community. Located in south Calgary, Midnapore has grown to become a beautiful landscaped lake community. Adjacent to Fish Creek park, the lake community offers residents instant access to Calgary’s pathway system. In addition to some transportation developments, Midnapore is transforming into a shoppers paradise with the addition of numerous big box stores. Midnapore is an ideal lake community for young families in Calgary. Bordered by Fish Creek Park, Calgary’s Sundance community shares its atmosphere and landscape with Midnapore residents. The area is expecting an LRT extension that will reduce residents’ commuting time. With future transportation developments and variety of shopping amenities, Sundance is shaping up to be a highly sought-after lake community. Constructed around 10 acres of water, the community of Arbour Lake features mesmerizing mountain views and a strong connection to nature. Situated in north west Calgary, the lake community offers its residents a 4,000 square foot lakeside pavilion for activities such as swimming, canoeing, skating parties, and fishing derbies. Calgary’s Coral Springs features a 16 acre lake and two recreational parks, with the ambiance of a charming California-style community. The lakeside community is perfect for young families or first time home buyers. Houses were created with architectural layouts that emphasizes its fun theme. Staying true to its Californian nature, Coral Springs offers residents recreational activities including beach volleyball and swimming. Wintertime activities include hockey and a Winterfest festival every February. Located in Okotoks, Crystal Shores Lake is a young community with convenient access to Calgary. The real estate market at Crystal Shores is ideal for families searching for homes with uninterrupted lake views. The magnificent landscape and tranquil environment make Crystal Shores Lake a highly sought-after place to live in. 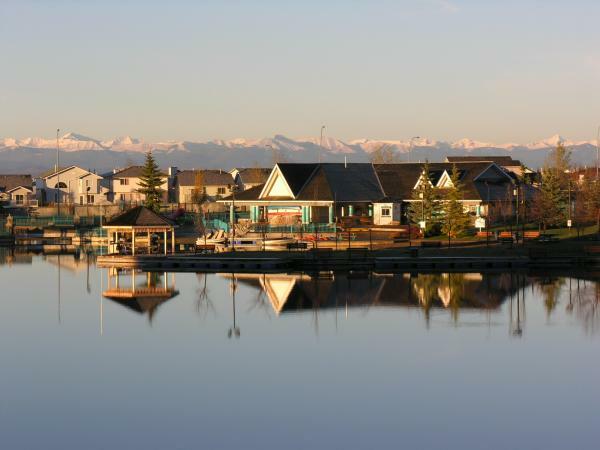 Alberta’s Town of Chestermere offers a tranquil, lakeside lifestyle with a country atmosphere. Its proximity to Calgary allows residents fast commuting to city-sized amenities and work. Chestermere’s cream-of-the-crop attractions are its spacious lake and an 18 hole golf course. The lake community continues to demonstrate a bustling real estate industry, and more housing developments are being added every year. The award winning community of Elbow Valley Lake is a mere 20 minutes west of downtown Calgary. The community features mature aspen trees and three primary lakes, harmoniously blended to create a unique landscape. Residents of Elbow Valley can bask in magnificent mountain views, and the collection of stunning architectural estates and country villas. Selling? Get a Lake Community Evaluation! Question about Lake Living? Give Us a Call! Imagine yourself in a relaxed community, where comfort and nature come alive. The open space, fresh air and soothing lake view are incorporated into your everyday life. Your lakeside house paradise can be found right here in the city of Calgary! Calgary lake living offers a comfortable, tranquil atmosphere right in the middle of Alberta’s largest city. Calgary lake communities are vibrant and continue to grow, and many offer spectacular mountain views in addition to their lake and water features. Many Calgary and area lake communities offer unique styles of homes, and several of these neighbourhoods are master-planned and have architectural controls in place to protect the integrity of the original vision for these communities. As a result, Calgary’s lake communities have created a high standard for neighbourhood design, integrating a mixture of private and public spaces. Lake communities foster the ideal atmosphere for young, active families, providing ample opportunity for outdoor recreation amid the hustle and bustle of a city life. Many of these communities offer year-round organized activities and encourage neighbours to mingle and get to know each other. Calgary lakeside homes are close-knit with a know-your-neighbour mindset. Some lakeside community associations host community programs that appeal to a wide variety of resident interests, such as fireworks celebrations over the water. Coral Springs in North East Calgary hosts a popular Winterfest Festival every year in February. Summertime activities can include swimming, wading, golfing, fishing, canoeing, and beach volleyball depending on the community you choose. During the winter, many residents continue to access the lake for activities such as skating, tobogganing and hockey games. In addition to their lake features, these communities provide ample green space around the water and throughout the neighbourhood, perfect for strolling, cycling or jogging in a quiet, natural setting. For those in love with lakeside living but reluctant to leave the convenience of the big city, Calgary does offer a range of lakefront and lakeside properties that either front or back onto the waterfront. Some homes in neighbourhoods like Arbour Lake, Sundance, Midnapore, McKenzie Lake, and Lake Bonavista have private docks, ideal bases for swimming and boating activities, or just to sit on with a glass of wine to watch the sun go down. But you don't have to purchase a lakeside home to access docks and beaches: most Calgary and area lake communities have an active Lake Residents Association that operates a community recreational facility and beachfront for the private use of neighbourhood residents. Many of these Associations run yearly events and coordinate activities, including swimming and canoeing lessons.